I used to love stories as a child. I would sit with my grandfather for hours, admiring the adventures he was coming up with. He was full of imagination, making the impossible seem possible. I thought the stories were teaching me everything I needed to know. From this point of view, I realize that back then, I understood the world more than I do now. But, the stories were not education. “Go to school,” – they said. “That's where you'll learn about life.” And so it started – my journey towards knowledge. As any other kid, I never imagined that gaining knowledge would involve endless hours of boredom. Letters, numbers, boring lessons that had nothing to do with the knowledge I wanted to get. My real education started with grandpa's stories. It continued with the tremendously long hours in the classroom, which killed my creativity. Throughout my years at school, I've learned many things, but the most important lesson was devastating: there is something wrong with the whole educational system. Each and every student is an individual. 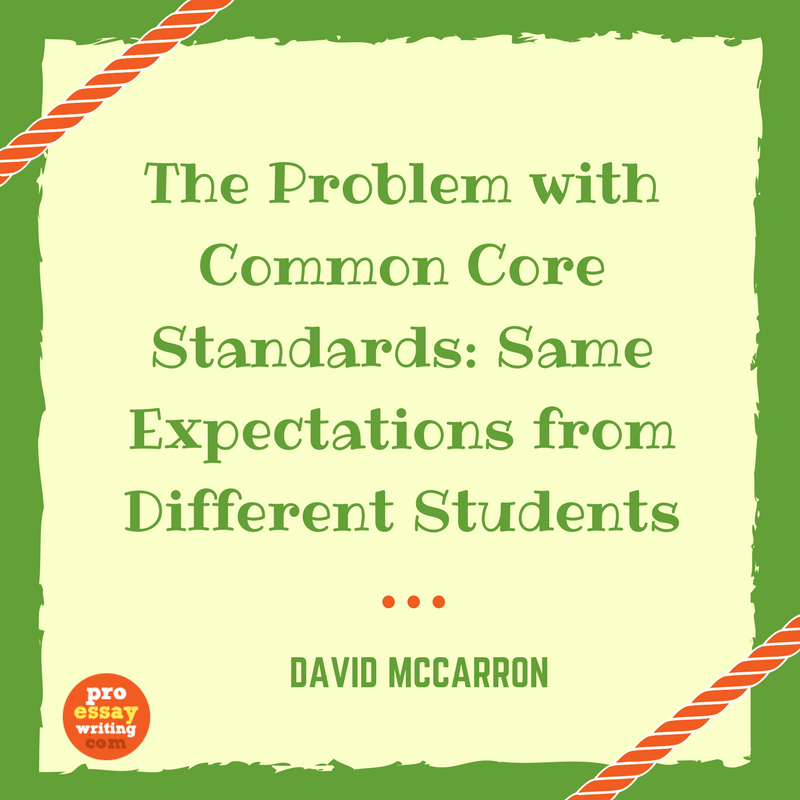 When they are placed in a common system with common standards and common evaluation principles, they become common, too. When the Standards & Accountability Movement started in the 90s, the idea behind it was unification of education across the states. These standards were supposed to define what students were expected to know at a certain level of education. From that point of view, the standards are justified. When students decide to go to college, the institution will need to evaluate their capacity. The only way to compare one's knowledge and achievements with those of other candidates is through this type of system. When a team of academics developed the Common Core in 2009, they set benchmarks that put all students in the same mold. Now, we have precise expectations to meet and we have to know the same things everyone else does. High-stakes testing is a serious issue, which defies the principle of gaining knowledge. What if a student doesn't know enough on the day of the test, but they learn everything few days later? They will have the knowledge, but a single test ruins their grade and affects the chances for getting into college. Under the effect of common expectations, educators have forgotten the fact that tests are just tests – they cannot measure all aspects of knowledge and intelligence. Children have an impressive creative capacity. They see things teachers don't see, but the creative potential is not what they are supposed to develop at school. When my parents told me I would learn what I wanted to learn at school, I expected to learn how to tell stories. The focus was different: not creativity, but literacy. When my grandfather asked me questions, I didn't know the answers. Still, I took chances at guessing. He was not a teacher, but that was the most educational process I've been subjected to. He knew how to trigger my sense of wonder and my curiosity to explore ideas. When my teachers asked questions, I didn't make guesses. I was too afraid of being wrong and ridiculed. Lesson after lesson, test after test, and I suppressed my natural creativity. The standard evaluation methods left no space for being different. I kept comparing myself to other students, and that's not what I consider to be healthy competition. This educational system only made me try to be like everyone else. Throughout high school, I wondered: why don't they let me explore arts and literature first, and teach me only the basics of math and science? I knew what I was good at, but the system didn't bother about my priorities. The studies left me with no time to read the books I wanted to read and paint the pictures I envisioned. Science is important, but so are stories. So are dance, mechanics, and sports. By the time got to the point of choosing college, I stopped wondering. All my grades were fine, but I wasn't fine. I wanted to compete for the best colleges to make my parents proud. I compared myself to all other students in the class, trying to figure out what made me better than them. Tests, comparisons, struggles to be better… this was a vicious circle that turned me into a bitter, confused person. The biggest problem was that I no longer knew what I wanted to be. The point of realization came when I started reading Cortazar's Hopscotch. This was the most creative piece of literature I've laid my hands on, and I couldn't understand it. It took many minutes for me to process a single sentence. I thought: back then, when my grandfather used to tell stories, I would've understood this. My mind was open enough to process creativity. Now, my whole mind was occupied with definitions and formulas I could live without. The Common Core Standards do not support creativity. On the contrary – they suppress it. I never wanted to become a university professor. I never had an interest in math, economy, and science. Is that a crime? If the educational system taught me only the basics of all subjects and the professors encouraged me to pursue my own dreams, everything would've been different. Maybe such approach would lead to mistakes. However, it would give me complete responsibility over my life. Instead, I am being pushed to achieve imposed goals and compare myself to other students. What do I want to be? The professors didn't teach me that. I see the teacher's role as a mind coach. They should motivate students to learn and work and direct them towards the right sources of information. They should share their experience (something a student doesn't have) instead of explaining information (something the students can reach at any moment). The Common Core doesn't give that space to educators. In a metaphor, I felt like it was assessing the ability of a fish to climb a tree.